Easels are a versatile solution for displaying artwork, products, and presentations. While most people might think of easels as purely a tool for artists, our customers have inspired us to share 6 more clever applications. The first and most common way to use an easel is as an art tool. Whether you're a skilled artist, a student, or someone who enjoys a casual paint & sip — chances are you'll use an easel to support and stablize your artwork. Which easle you choose depends on the size of your artwork and application. Paint night hosts, art teachers and casual crafters tend to go with smaller tabletop art easels since they take up very little space, they're easily portable, and they get the job done. 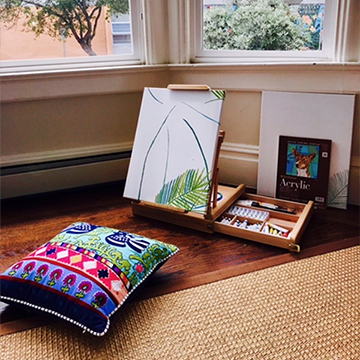 Serious painters and illustrators often buy studio easels, french easels, or pochade boxes, which are usually adjustable for canvases of any size, and include storage for brushes, palletes, and other paint supplies. You don't need to have a canvas to use an easel. Many professionals these fixtures an essential presentation tool to be used in conference rooms, at functions, and on the tradeshow floor. 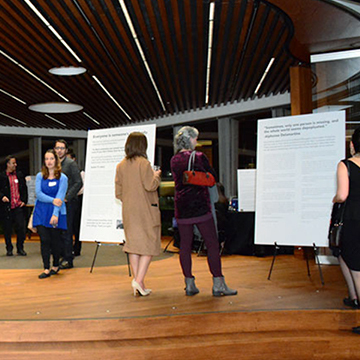 As a lightweight alternative to trifold display boards, non-profit organizations may present their story to potential donors on poster boards mounted on easels. Corporations can use flip chart stands for presentations from routine meetings to crucial client pitches — (also great for Demitri Martin's stand up specials). There are countless ways to display promotional signage in a pop-up shop or brick-and-mortar store. 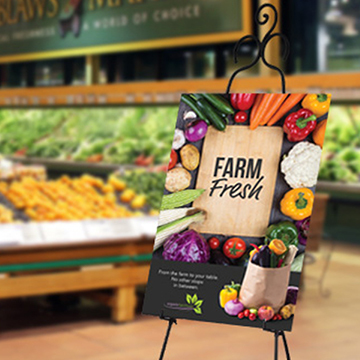 Retailers looking for easily portable retail sign displays can pair their poster boards with a sturdy tripod. For frequently changing promotions like restaurant menu specials, you may like to use an write-on chalkboard display. 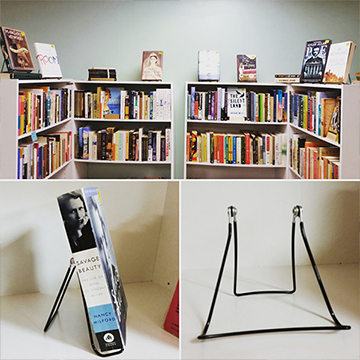 When you want certain books to stand out from the rest on the bookshelf in your home or bookstore, using a small wire easel is an excellent solution. Easily prop up your favorite novel or a bestseller on the top shelf and display the cover. Bookstores often use these book display stands to showcase new or popular titles as well as up and coming authors. This allows customers to easily see what new titles the store is promoting, as well as inspire them to browse similar options nearby. In addition to books, easels are an effective way to prop other small products on store shelves, craft fair tables, or at a raffle. When you stand your products up on a merchandising stand instead of lay them flat, it makes them easier to see and more approachable. When an artist finishes their work, they often display the completed canvas at an art gallery. Gallery paintings are usually displayed in one of three ways: on a wall, art grid, or an easel. Wedding planners are very creative when it comes to decorating a venue. To greet guests, many planners opt for an elegant and classy solution like a decorative frame mounted on a fancy wrought iron easel , or for a more rustic wedding a wooden display. Greetings aren't just for weddings, though. You can place an effective welcome message at the entrance of a church, function hall, or conference room, too. We would love to see how you're using easels. Show us on social media by tagging your photos with #Displays2go and you could get featured!